Move light rail to serve more people? With the government supporting light rail, hopefully the team/s tasked with the project have now been able to move on from justification to delivery. While the high-level decision has been made, there’s still a lot of detail that needs to be worked out. 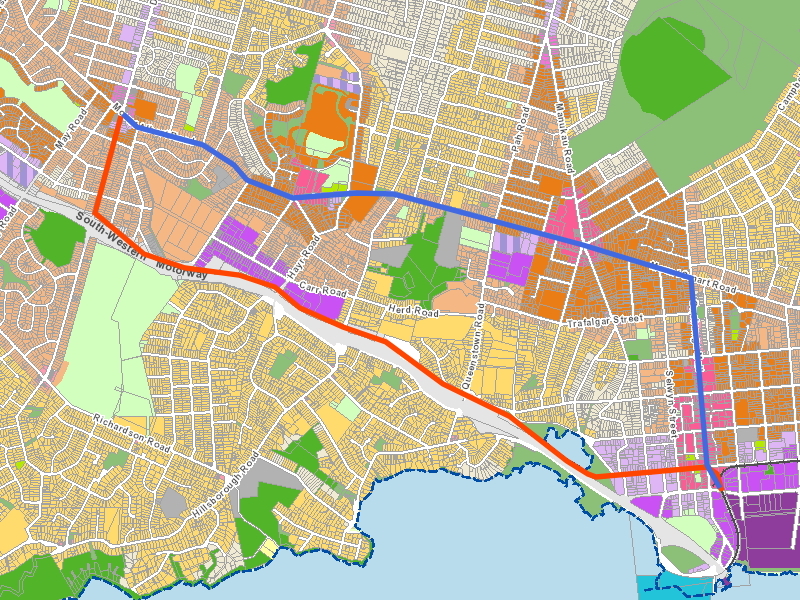 One area we think needs a bit more debate is the route through the southern isthmus between Dominion Rd and Onehunga. In the trade-off between speed and catchment, speed appears to have been the only determining factor here. Motorways don’t make great public transport corridors. That’s because motorways tend not to be too welcoming towards people (noise, pollution etc). They also make accessing stations difficult for much of the catchment whilst simultaneously suppressing nearby development potential. After all, how many people choose to live next to a motorway. Motorways corridors are normally only used because they’re easier to deliver. There simply aren’t that many potential sites along that stretch of the route for a station. This is highlighted in this map showing potential catchments of light rail below with a big gap in the middle around Hillsborough. We think an alternative could be to instead send the tracks along Mt Albert Rd, Mt Smart Rd and then down Onehunga Mall. This is shown below in blue, compared to the current planned route in red. There are number of reasons why we think this option should be investigated and most of them revolve around serving more people. We already know that around 1,500 dwellings are planned to be built in the old Three Kings Quarry. Housing New Zealand are redeveloping many of their properties nearby, including many on the southern side of the mountain/quarry. Perhaps these development areas could be served by other light rail routes, such as as the proposed lines down Manukau Rd and Mt Eden Rd. However, AT and the Council have gone silent on these routes and they appear to have been quietly dropped. If those routes were eventually built they would still tie in nicely with this proposal. Both routes are close to being identical in length however the blue route uses existing roads. They would still have be rebuilt, and maybe even widened in places but I imagine that it would still stack up well compared an entire off-line route with multiple bridge structures and other works. It also conveniently doesn’t require any of Kiwirail’s Avondale-Southdown designation. Perhaps the key disadvantage I can see with this idea is the speed. On the red route, the motorway route would afford higher speeds than the Mt Albert Rd option. For this post I’ve estimated just how much difference that might make. For the blue route I’ve assumed an average speed of 30km/h. That assumes vehicles would travel at about 50km/h along the street and have signal priority but would also have to stop at stations along the way. Based on the approximately 5.5km trip it would take 11 minutes to get between Mt Roskill and Onehunga. By comparison, for the red route I’ve assumed 30km/h for the end of Dominion Rd and on Princes St in Onehunga with 60km/h in between those two bits. That comes out at around 7 minutes. Much of the route may require road widening and along with that changes to how locals use the street. That could lead to more people opposing the project and making it take longer. As mentioned earlier, motorway corridors tend to be easier to build, in part that’s because there fewer locals to complain. A 4-minute extra trip to put light rail past 10’s of thousands of extra people seems like a debate worth having. What do you think? The Carr Rd workers and the Schools might not be as well server by this route although the walk up and down the Hayr Rd Hill is not long. Great suggestion!! Keep them coming. Maybe have a stop near Bremner ave to cater for the Mt Roskill schools, Near Thee Kings Mall for the next stop, Near Marcellin College for the next stop, On Royal Oak Mall side of the roundabout for the next stop, between Selwyn st corner and Onehunga mall corner for the next stop, Grey Street for the next stop Then Onehunga Train station for the last stop in the blue route. Some of them may be too close or too far away. I haven’t lived in the Onehunga area for 20 years so can’t visualize the distances. Why not just have a proper cross town route? Pt Chev to Mt Wellington. This feels like the antithesis of the push we;re having away from snaking single seat trips. The (eventual?) Mt Eden and Manukau road LRT will need to be connected. The Crosstown bus routes would still exist but we have a choice of sending LRT down where lots of people live with high development capacity or down the motorway servicing hardly anyone with a saving of only 4 minutes. Four minutes seems reasonably significant to me, it is added to every trip south of Onehunga every day. Agreed. And it adds increased difference between how fast the CBD-airport trip will be on HR vs LRT as well. The suggestion of a crosstown LRT certainly deserves discussion in the context of creating a seriously viable rapid transit “network”. The creation of a LRT service to the airport via Dominion Road creates great opportunities for “leveraging” the network to passengers’ advantage at a (relatively) low marginal cost. Specifically, a connection from the Mt Roskill stop along either the Avondale-Southdown rail corridor OR Mt Albert Road to Mt Albert Town Centre and then beyond to Unitech and Pt Chevalier could be leveraged off the “Airport Light Rail” line and link the Western Line into a network. The Penrose to Onehunga HR line could relatively easily be converted to LR operation with benefit for the simplification of the HR network. An extension down Great South Road and across to Sylvia Park would add another “network” element and complete a connection between the Eastern and Western Lines via the Southern Line and the “Southwestern” (Airport) line, with huge spin-offs for the RT network as a whole. Another opportunity lies in an extension of the LR line west from Roskill to Sandringham, and then south down Maioro Street and Tiverton/Wolverton Roads to meet the Western Line at New Lynn. This could also be done in conjunction with the eventual conversion of Sandringham Road bus routes to LR, running these services right through to New Lynn. The creation of a real “network” of rapid services is key to the long-term success of public transport in Auckland in my view. Yes, some of these could be served in the interim by the “enhanced bus” operation proposed by CFN-2 (and also accepted by Labour?) but the real “bang for buck” in terms of growing overall PT usage will only come when there’s a genuine Rapid network that covers the entire region and provides for multiple transfer opportunities between individual lines. I agree. And this would complement far stricter rules on big developments wrt car access and parking. Unitec’s new development, for example, is a lost opportunity. Could have been car free. Imagine this with LRT running past. And of course, the promised Westgate LR line would also connect into a crosstown LR line. Such a line would then connect the Northwest/Westgate line, the Western line, the Southwest/Airport line, the Southern line and the Eastern line together into a real network. Start with the core Roskill-Onehunga-Penrose section, and then work outwards at each end. There is no doubt that this would be really well patronised, given the connectivity that it offers, and is essential to the creation of a real rapid network. 3 hour ride from orewa to airport… sorry but I really think that may happen. Not sure getting ppl from Orewa to the Airport is the best objective considering it will make up a very small % of demand. Connecting some of the highest zoned areas in the Unitary Plan to Light Rail especially if paired with KiwiBuild is much more useful. Sounds more like an argument for Manukau Rd LR as some stage. How amazing would it be to have the rail going down onehunga mall. +1 – transformational for Dominion Road, and Onehunga Mall in one go. Good idea, should definitely be investigated a bit further. Less interference with the Avondale-Southdown line. Can you show us a heavy rail network map with your ideas, Blair? The question here is what are we really trying to achieve – a quality rapid transport solution with less stops, but most stops being interchanges and not relying on walk-up commuters or simply increase coverage and capacity? I think these two goals can not be satisfied at the same time without significant compromises. Adding 4 minutes doesn’t sound like much, but it does add up. In my opinion we should leave this as planned and instead create a proper cross town (Pt Chev to Onehunga) bus corridor, with bus priority all along the way. I have to agree – Already LR is up against buses and cars for travel times from one anchor to another. Stacking the deck against LR by making it even slower is a bitter pill to swallow. I was thinking that LR is going to be very successful as it is, as well as serving Carr Rd and to a lesser extent Hillsborough. When people see the value of LR, they’ll demand service as well. It’s at this point that we can easily push rail along Onehunga Mall and consider where to from there. Why not Manukau Rd to Newmarket? Are there heat maps of current PT usage/catchments? The solution to get LRT to these homes is to build LRT down Mt Eden Road and Manukau Road. In the meantime we can pump way more buses down these roads and improve bus lanes. We shouldn’t build a sub-par Dominion Road and airport route just because the Manukau Road light rail won’t come along for another ten years. Luckily, we do: Symonds Street. Buses on Wellesley and Albert, LRT on Queen and Symonds. LRT on Symonds would be very frustrating from a Bus ops pov also the nightmare the Newmarket – Symonds section would be. Newmarket to Symonds also fairly simple. We can move all Grafton Bridge buses to Grafton Road and Wellesley. Park Road is almost 40 m wide from Park Ave to Domain Drive. We can move the bus stops to somewhere more sensible and make the road one way for cars to permit access to hospital carparks Off of Grafton Bridge the LRT is shared with buses until Domain Road where it is trenched through to the Carlton Gore/Davies Crescent intersection, then runs on a closed to cars Davies Crescent to Newmarket station. There’s about 5,000 people an hour across a dozen routes on Symonds St. You can’t just move them all over to Wellesley or Albert to put one route down there, those corridors are going to be full themselves. The city need more capacity, new capacity. This is about ongoing growth over the next few years, not shuffling the existing deck chairs. If you want to put another line somewhere it can’t simply displace existing capacity. Isn’t this also an argument against using Dominion Road as the first LRT corridor? No it’s actually an argument for it. Dominion Rd is the busiest line on symonds Street. Taking that off symonds and putting it on Queen not only creates a new high capacity corridor on Queen, it frees up some twenty buses an hour on symonds for the remaining routes to grow. Originally posted down bottom. Reposting where it belongs. This is a remarkably disingenuous argument, most of those buses would be replaced by LRT or already use Wellesley Street (or both). The buses using Symonds Street (North of Wellesley) are the 27, 53, and 321. The 321 is a hospital link, it can use Stanley Street and Beach Road. The buses using Symonds Street (South of Wellesley) are the 22, 24, 25, 27, 53, 70, 295, 309(x), 701. 22 New North Road; Take route to Newmarket, not CBD. Thanks for that, Sailor Boy. Err, of your whole list its only the 25 group that is replaced by LRT. Mt Eden road, etc, will still need its bus and it will still be as busy as ever. Also don’t think about tomorrow, think about ten years and more from now. Also shifting to Grafton Road doesn’t really achieve anything, you just overload Wellesley Street quicker instead. None of that creates new capacity. Clearly you didn’t read my last comment: “most of those buses would be replaced by LRT or already use Wellesley Street (or both).”. Switching buses that use Symonds Street and Wellesley to use Grafton Road and Wellesley Street has absolutely no impact on Wellesley Street. You may not think that 4 LRT lines is a practical idea. I agree. The practical number is probably at least 12. No I didn’t miss it, I don’t agree with it being the solution to get transit to homes down three kings way. To add two extra light rail lines (two billion?) and unpick and shuffle the entire bus network just to swap bus capacity for LRT capacity on the same corridor seems like a low priority to me. Then you are disingenuously criticizing my proposal. If my proposal includes something you can’t make an argument against my proposal based on it not being included. This is called a strawman argument. You aren’t swapping capacity. You are adding capacity. You said 5,000 people move on Symonds Street, even if this is one way, 24 LRT vehicles per hour have a capacity of 10,800 per hour and my proposal keeps all of the other buses the same (except NNR, which transfer at any one of a dozen or so places). But Mt Eden Road and Mankau Road won’t attract anything like 10,800 people per hour, they currently move 1,400/hr at peak. So you’re kicking off eleven busy frequent bus routes carrying 5,000 people to put back in two tram lines carrying, at best, 2,000. That’s a net reduction of 60% of your functional capacity. If you want to convert Symonds Street to light rail you need a network plan that can at least deliver what it carries in bus passengers today, otherwise you’re going backward. I think you were right when you said you needed 12 LRT lines, I think you do, there is no small iteration that works. I’m starting to get pretty sick of you deliberately misrepresenting my argument. Three routes (Mt Eden, Sandringham, and Manukau), not two. The current volumes are restricted by the capacity and speed of buses on these routes, so that would obviously increase. I’m not kicking off any bus routes. I’m moving those that use the top half of Symonds Street to Grafton Road and replacing those that use all of Symonds Street with LRT down Symonds Street. I’ve repeatedly and emphatically stated this, so it’s pretty disappointing to see you deciding to just lie about it. perhaps you could name one bus route (other than New North Road) which would function with more than a minor difference. “carrying 5,000 people to put back in two tram lines carrying, at best, 2,000. That’s a net reduction of 60% of your functional capacity.” Even if we accept your number of 2,000 for LRT which is frankly comical, that capacity is only a replacement for New North Road, Sandringham Road, Mt Eden Road, and Manukau Road, as all other bus routes will still be operating. So we are replacing 48 buses per hour with 24 LRT that will be faster and no longer suffer overcrowding. Indeed, if you deliberately misrepresent any plan it probably won’t work. Ok i’ll concede that point, if you are happy to spend $4b or so to build four light rail lines in parallel, and have a Wellesley Street corridor that can take an arbitrarily large volume of buses from grafton road in addition to those otherwise remaining there, you’ll have network that performs better than the current arrangement. But I’m not convinced its the best outcome you could get for that investment. I think one of primary requirements for light rail is that it needs to be the fastest way to get to the areas it services, including the Airport. If it’s not, many people will continue to drive, especially off peak, it will be viewed like a very pricey bus upgrade, rather than a transport revolution. This could make future light rail projects far less politically viable. I believe that the definition of catchment should be broadened from ‘within a 5 min walk’, to include ‘all those for whom this service is the most viable means of travel’. Increasing the 5 minute walk catchment at a cost of an extra 10-15% travel time could greatly reduce the catchment by this broader definition. In the long term, whether 5, 10, or 20 years, we hope to have light rail on Mt Eden Road and Manukau Road. This will only happen if this ‘revolutionary’ investment returns a ‘revolutionary’ change in travel. Also, in this long term, the option B route would mean hugely duplicated services, and still no express service to the airport. That would be totally awesome, and very effective. Imagine having Takapuna on the busway, connected to all the other busway stations directly, and to downtown. If we could do that for four minutes run time we totally should! That would have been terrible for most people and would have stopped the busway being the as good as it is. Takapuna is in the wrong place to be a Metropolitan Centre. Because it was the wrong place the earlier planning was to build a new centre near Northcote Road. That is part of the reason the Northern Motorway took its alignment. But the Takapuna shop keepers got themselves elected to the Council with Fred Thomas as their Mayor. They stopped the sub-regional centre development and turned the area into a golf course called AF Thomas Park. Takapuna is still the wrong place and there is little point stuffing up the transport network to make it a centre. +1, the success of the busway is how quick it is and that it feels like a straight line. If they could do it in four minutes it wouldn’t be either terrible or stopped the busway performing, it would be totally amazing. But that’s theoretical, it would add much longer than four minutes. When one lands at Heathrow airport do you a) catch the all stops underground line to the city, or catch the fast Heathrow express? That should be all that needs to be taken into consideration when deciding to spend $2.5 billion over 8 years for a slow light rail service to the airport vs a much faster heavy rail line via Puhinui to the airport for $600 – 700 million in just 4 years. HR will also serve a much larger portion of Aucklanders and Waikato commuters. HR to the airport wins on speed, price, construction time, integration of existing rolling stock and population it will service. The answer is who cares since the Airport will make up next to none of the demand for the line. You spend $600 – 700m to add a single station onto the network that isn’t value for money. Its actually worse since you take trains from the Southern/Eastern lines to make it work as its a spur you propose not a shuttle so you take capacity from major growth areas to serve one station. I catch the all stops or a few stops. The heathrow express is a waste of money. I suspect most people catch the Heathrow Connect. Heathrow Express might be viable in London, with a much bigger population, but there is no way Auckland will provide enough people willing to pay a premium price for an express service. I catch the all stops because where I stay is in Acton, not in the city. The Express is entirely useless to me. You’re proposing a line that skips where hundreds of thousands of people live, don’t forget most users of the line will be just folks going to work our going about their day. I’m not sure how your plan serves the Waikato and different to the current plan. Presumably they still transfer at Puhinui or Papatoetoe, or are you diverting intercity trains down to the airport then backing them out again? As it happens Jon I can answer that question: I catch the Piccadilly line because it is so cheap instead of the outrageously expensive Heathrow Express. I caught it both ways in September and October. And a quick look up and down the train showed that I was one of many. Door to door from Knightsbridge to stepping into Terminal 2 it was 50 minutes, cost something like GBP3.60. The next week my partner took a taxi which took 40 minutes and cost 45 quid! So, yes I would take the proposed light rail to the airport every time. In fact I go to the airport now by PT (if I have a carry on bag only) : train to Papatoetoe and 380 bus to the airport. It normally takes me about 10 to15 minutes longer than the dedicated “express” bus and for a fraction of the cost. 380 is great, i use it all the time with the train. increased freq will help me too. I use the Papatoetoe/380 services too. It’d be great if the train just turned off and made it a single service to the airport though. Once again PTUA is thinking about the airport as being the sole destination of significance along the proposed route, which is staggeringly naive and short-sighted for an organisation which claims to represent the interests PT users. Jon conveniently ignores three very significant elements of the current LR proposal: (1) it is in effect a “Southwest Line”, serving a number of communities which currently have no access to any form of rapid transit, (2) the proposed line starts to invest in the “network” aspects of a rapid transit network, which a link to Puhinui does absolutely nothing for, and (3) it doesn’t (unlike the Puhinui extension) duplicate services on an already well-served section of line, the southern rail corridor. Surely the PTUA should support extending “rapid” services to as many parts of the PT network as possible as a core priority?Sorry to say it, but PTUA is so ideologically hidebound in its support for heavy rail in both the airport and north-west areas that it really shouldn’t claim to represent “PT Users” at all. I still think that we’ll end up with both LR and HR at the airport, with different alignments and different catchments. LR will probably go in first and later on we’ll decide we need HR as well. Right now the stopping service that enhances the network more will probably what more people will get utility out of, so is most likely to built first. Jon the answer is simply that both are needed, because they serve different catchments. There will soon be a high quality connection to all rail services at Puhinui, making all Southern Line, Eastern Line, and future InterCity trains ‘trains to the planes’, without any additional branching. This will surely be the primary route taken by anyone on those lines including those in the City Centre and south of the city, including Hamilton etc, to the Airport. But for the hundreds of thousands of people on the Light Rail catchment, all through the isthmus, Onehunga, and Mangere, it will make much more sense for them to take that system to the Airport for travel or employment, so they will. But the Airport is just the anchor of a line that serves those communities for many journeys, not just to that destination. Also for those to the east of Manukau the east-west service through Puhinui will be the quickest and most direct. I’m glad you aren’t a professional estimator for the NZTA or Kiwirail, the country would be broke by now. I’m also not sure how an HR line that serves 0 new passengers services more passengers than an LRT line through areas with no rapid transit. Fortunately “Sailor Boy” (who ever she is and is too ashamed to use your real name, most likely an AT hack) the costings have been very well worked out by people who build real railways, not bloggers. HR will service the airport, for Harriet who can’t grasp that place, 19 million pax per year + workers is not bad for a station. Additionally it would serve Otahuhu Transport Centre (which Greater Auckland rave on about how good the New South Bus Network is) which will feed thousands into that station for connectivity to the airport. Additionally, it would stop at Panmure Transport Centre, which I note GA is also heavily endorsing. But what would you or Auckland Transport know? Ignorantly ratepayer funded AT have NOT undertaken a study of other key corridors. Only the rather amateur report promoting LRT on a slow, costly $2,500,000,000 LRT line to the airport, now reported to take 8 years to complete. Jon you attack someone for not using their real name in a post where you don’t use your real name. Hypocritical much. Also if you’re going to criticise others for being amateurs (and many readers/commenters aren’t), what are your qualifications/experience to say they’re wrong. You know who Sailor Boy is but? You are the blogger in that case, and the estimate by people who build real railways is much higher than yours. Terrible grammar and doubly hypocritical; you don’t use your real name and you are an NZ First hack. Slow: nope, extensively covered here, as fast as the HR via Onehunga, marginally slower than HR via Puhinui. $2.5b: not really, the Dominion Road section is being built whether we extend it to the airport or not. 8 years: Sort of, if we build it without great urgency. More respect for other posters required here. It’s also quite inappropriate to suggest that posters are AT stooges without any evidence to support that. And even if a poster does happen to work for AT, it’s by far not guaranteed that they will support the “party line”. Having worked at AT in the past I can assure you that there are many, many shades of opinion within that organisation. They could well be AT stooges as Matt L and co never require those posters to ever use their real name. So a safe is bet that “Sailor Boy” work for Auckland Transport in the huge PR and communications department, or perhaps is someone from GA? Matt L – transparency is a good thing, does GA agree? “Sailor Boy” or girl (who knows). There is not complete objective study of HR via Puhinui to Britomart. Would the feeble AT report promoting LRT to the airport stand up to a peer review? Given that three of the moderators have met me in person, I’m pretty sure they know who I am. Transparency would be good, except that I couldn’t ever comment as I work in the industry (thankfully not at AT, I couldn’t take the pay cut and pay my mortgage). The report presumably already has stood up to peer review. I don’t understand what you mean by ‘complete objective study’; it would be really unusual to do an entire study on one option in a business case. Also, the report did not ‘promote’ LRT. It found LRT to be the best option through an objective analysis of options including the Puhinui link. As I said, more respect for posters is required. You’re still suggesting that it’s a safe bet that people who don’t use their real names are AT PR hacks. As others have said, there are many reasons for using a nom-de-plume. It’s insulting to dismiss their opinions as AT spin without solid evidence. Are people actually going to catch light rail to the CBD along the blue route you propose? It looks to me that for many parts of this route a bus trip along Mt Eden Rd or Manukau Rd would be just as quick or quicker. I’ve suspected that is the reason there is only one stop between Dominion Rd and Onehunga. Further stops would risk the embarrassment of under-use as people prefer to catch the bus. Yes as the Light Rail has access to Uptown, Midtown, Downtown and WQ while the buses usually only hit 1 or 2. Living as I do in the Hillsborough area, I can tell you that the bus is pretty poor, so any extra PT service is welcome. But I do think there should be another stop between Dominion Rd and Onehunga – there seems to be a perfect place on the eastern side of Queenstown Rd just past the motorway onramp. That would also serve Onehunga High (and quite a few students come there from Mangere Bridge), and also the Onehunga Bay/Taumanu waterfront reserve, and there are a few new housing developments underway nearby. Perhaps then the Hillsborough stop would be better placed on the western side of Hillsborough Rd. I personally think that the priority routes for LR to begin with, should be up the NW motorway as far as Westgate and along Dom Rd as far as the Mt Roskill shops. Those routes plus BRT between the airport and Puhinui Station is Stage 1. Stage 2 would be to extend the Dom Rd line – either to Denbigh Ave / Stoddard Rd and back up Sandringham Rd / NNR or to Onehunga either via the motorway or via Mt Albert Rd-Mt Smart Rd-Onehunga Mall after a more detailed look at service area catchment. As part of Stage 2, after a more detailed look at ridership on the Puhinui-Airport BRT, decide on the value of LR-ing the route or putting in HR. Getting the LR extended across the Manukau Harbour from Onehunga should wait til Stage 3. Mangere is better served by frequent bus services connecting to trains at Otahuhu, Papatoetoe, Puhinui, Homai, Manurewa and Takanini. The upgrade of Takanini Station is long overdue and its most concerning that nothing is being done there to provide a better rail service experience for that community. I’d argue that the route between Onehunga and the airport is vital. 1. All the volume of traffic over Onehunga bridge is currently cars and trucks. The projection is for this traffic to exceed the traffic over the Auckland harbour bridge. 2. Currently now due to Waterview the tail from SH1/SH20 in Manukau is back to Onehunga – can take 2 hours to get from Onehunga to Wiri. 3. There are no alternatives and even projects like EWL would just feed this problem. Getting people out of cars and into PT though this corridor is vital. There are arguments about building a future city, building out from the centre and maximising catchment. However, these areas like Dominion Rd, etc have PT now. This calendar year will like see rolling total of 20 million passengers though the Airport . 20,000+ people work at or around the airport and projected at 27-30k by 2021. We need to switch this traffic off SH20 and onto PT. Mt Albert Rd is absolutely the right thing to do. It uses light rail for what it does best rather than using it as a bit of this and a bit of that the way the AT plan does. If light rail is used to connect communities then it will succeed. If it is used as a slow and crap metro rail then it will fail. 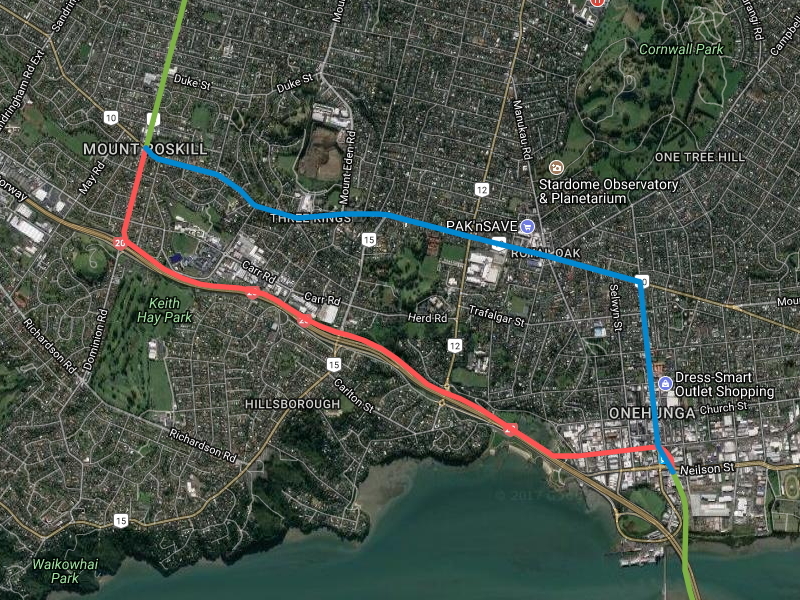 I don’t actually think Mt Albert Rd will work – I cross it (by bike!) each day at Pah Rd, and there is almost always two lanes of stopped traffic heading east in the morning and west in the afternoon. Airport-City LRT is not going to be an alternative for these people as most will be going further east/west, not north/south. Also, I can’t imagine the Royal Oak roundabout with an LRT line going through as well – it’s already far too busy, and again, the LRT route doesn’t match where most people in that area are going. Royal Oak can either be a successful town centre or a busy intersection but it can’t be both. The best answer is replace the aggressive roundabout with a set of traffic lights and just live with the queues and delays. There is a motorway system for people going east-west and alternative north south main roads. It is more important to have people able to cross the roads and access good PT. One of the justifications of the SW motorway was to relieve Mt Albert Road. But that will only happen if we accept the roundabout is well past its use-by date. Well said mwfic! That roundabout is awful and destroys any chance of a community vibe. +1, it’s an inner ring town centre, traffic is going to be terrible, deal with it. IMO the source of the traffic is primarily Mt Albert Rd. If it was made unappealing from Pah Rd to R.Oak (two lanes, or 2+ full time bus), then traffic would work around it rather than using the roundabout as a concentrator funneling traffic in and out of Mt Albert. Has anyone done analysis of traffic though the corridor? Video and license plate analysis or whatever? Mt Smart Road to/from Penrose is high volume. Where is the traffic going to go if it;s pushed off with no alternatives? Church St? Greenlane? Both the Harbour and One Tree Hill domain serve to create a very narrow choke point. One advantage of this option is that you could easily replace the Royal Oak roundabout with traffic signals when the LRT is put in. Roundabouts and LRVs do not mix well on safety grounds. That would also improve pedestrian crossing safety. Yes probably why it is planned and I like the NN Crosstown 7 bus 15min freq, Pt Chev to Sylvia Park bus that will use Mt Albert-Mt Smart Rd. Current “equivalent” 009 going through Onehunga bus interchange is slow dog. So the core point and I’ll work on putting together my other points. After reading and thinking about a few of these comments during the walk back from the Onehunga Primary drop off, I think upon reflection that travel times ARE important. 1. This line is a new direction in transport policy and it’s performance will be endless debated. 2. Nick R pointed out to me when I was discussing with him about Sandringham Rd being a better route vs the THAB distribution that areas like the Stoddard Rd THAB zone could be serviced by bus. The same holds for Three Kings/Royal Oak. Onehunga certainly has the capacity with it’s existing bus depot to work as an interchange. 3. There is a matrix of delivery – capex, opex, travel times, catchment, engagement and consent process, build and delivery timelines, regulation. Trying to be a “all singing all dancing” service for the first line risks asking for too much. 4. Giving more to the north of the Manukau is potentially taking it away from the south of the Manukau. Just look at fig 8.8 above for why that’s not so good. 5. Fundamentally this core spiral route needs to be like a pseudo heavy (rapid) rail like line. Other services can feed into it on that basis, but if you add travel time to the central line it just adds travel time to the whole network. Few of the other points to consider. 1. Traffic flows on Mt Smart Rd from Onehunga Mall to Royal Oak roundabout need to be carefully considered. Particularly since most of this is from locations without PT network coverage. 2. Onehunga Mall from Arthur St to the station will return to being a pedestrian mall for this plan. While I’m not against this, there will be resistance from businesses (Dress smart, etc) to this plan. 3. Dealing with the pylons at Onehunga train station will need to be included in the budget. This is in either plan. 4. The fire station on Onehunga Mall may have an impact of decisions regarding the Mt Smart/Onehunga intersection. 5. This plan is basis the line even further away from the Stoddard Rd THAB zone. Plus I can’t see how buses from/thru this THAB zone as suggested in my other comment would then feed into this line. 6. The depot location – Stoddard Road (again) was mentioned as a location for a depot. Turning off at Mt Albert means this depot location would not really work unless you built lines there anyway. Either down Dominion Road or back up SH20 from Onehunga. If so, why not do the fast SH20 route first and then add a Mt Albert line later? Alternatively, where is the depot going to go? I just don’t see how trams will work with the traffic lights. The trams will get stuck at every set and we would have to ban right turns everywhere. It will take forever to get anywhere. They’re not trams, not in the Melbourne sense of little things tootling along in traffic at least. Most of the time you’ll have one light rail vehicle every five to ten minutes, which will have full signal preemption and run on dedicated lanes that are never used by traffic. So no, they won’t ever stop at the lights, or ever get held by traffic. Yes I believe that means right turns have to be banned except at signals, and winding back traffic capacity on those corridors. Sure, pre-emption will help, but I’m not sure pre-emption will work the way they are hoping it will. You can’t preempt a Barnes Dance. I expect trams will be stopping at lights quite often, especially in the CBD. Depending on how you do the pre-emption phasing you may actually attract vehicles travelling parallel to the tram route. Yes, you can. I’d love to expand this argument, but I truly cannot see how you came to this conclusion. The CBD is going to be the easiest pace to do pre-emption! There will be no parallel traffic! You wouldn’t need nor have Barnes dances on Queen Street intersecitons that have no traffic anymore. It doesn’t matter if you atttact vehicles in parallel to the LRT, because they are parallel and not ever running on the tracks. SB, if a Barnes Dance at Queen/Customs is 40s long (based on the size of the intersection), and if the barnes dance has started, you can’t preempt it and cut it short midway through the crossing. Imagine the long crossings at other intersections like on Fanshawe St. Once the crossing starts, you can’t cut it short. In order to achieve zero delay for trams you would need to prevent these crossings from starting, well in advance, because you can’t predict when a tram will turn up from either direction. You will end up holding pedestrians for a huge amount of time. They will just end up just running across the road. Nick, we don’t need barnes dances now, but disabled pedestrians still need to cross Queen at some safe location where they won’t get run down by trams. Doing this at intersections would be the most likely point. But, yes, most people won’t need to cross a pedestrianised Queen St at the intersections. I guess it depends if they will completely ban all vehicle access or not. Why have a barne dance? If the whole of Queen St is a pedestrian mall, people can cross anywhere. Will they really cross only at the intersections? Even if the cross roads still have traffic the pedestrian crossings along Queen St still work, and people can then cross against the trains freely. We won’t need Barnes Dances on Queen anymore, the only phases will be trams and peds along Queen then cross traffic and peds across Queen. Except that you can predict when an LRT vehicle will turn up. Firstly, you’re doing signal preemption at every light so in theory it turns up exactly the same time every day. In practice, the vehicle has a transponder that lets the signals know if it has been delayed so the signals can adjust accordingly. You also don’t need to achieve zero delay. I think you are assuming that some lights will hold the LRT up by a full cycle (2 minutes). If the LRT just waits at the previous stop a few seconds longer to get a green light you have saved 95% of that delay already. Pedestrians also don’t have to be held on red and nor do other vehicles. Parallel/non-conflicting movements can go concurrently. You need to be careful with your speed assumption. Modern LRVs with signal priority can usually achieve average travel speeds of 20 to 25 km/hr in street running, depending on stop spacing. From the published data, AT are assuming an average travel speed of 22 km/hr on Dominion Road. So your four minute time difference may be an underestimate of the time cost of this option. Yes my first impression was it’s going to be more than 4 mins cost. Another data point, I thought the trains achieve an average speed of about 30 km/h. I would be very surprised if anything which runs on the street achieves the same speed. Applaud the fact that you are thinking outside the square. Too many projects are based on an original idea that didn’t have a huge amount of research built in. Speed: even with traffic light priority there are a large number of extra intersections, some incredibly busy already. Also to get most of the advantages there will need to be a number of new stops. Couple that with the significantly slower max speed and I think it would be more like 10 minutes. Cars: I know you like to think no one wants to drive, but I don’t think this is the case. Are you talking about removing all parking from onehunga mall? Making all of mt Albert road 2 lanes? Adding extra phases to already very busy intersections? I don’t think it will be hugely popular. Cost: won’t they end up entirely redoing onehunga mall? Royal oak roundabout? Three kings? It would have to cost billions more. Development: I think you are missing large development opportunities near may road and stoddard road and roskill south. They will no longer be walking distance to a stop. Probably not as significant as around royal oak but worth considering. Delays: this would have to delay the project by a number of years. There will be a lot of nay sayers. Might not even get started before national can it. It’s great to toss around ideas but on balance I don’t agree with this one. If the LRT lines are intended to provide rapid transit from outer suburbs – the Airport, Westgate, Albany – in a similar way to the heavy rail network, then speed is key. Motorway corridors might be more difficult to access – and therefore have smaller catchments – but they allow for complete segregation from traffic and thus higher speeds. Also, by mirroring key motorways – SW, NW and Northern – we give motorists a direct alternative to driving. Travel time to the CBD was already the main objection to LRT to the Airport. The current plan strikes a nice balance between exclusive rights of way and on-road running. Trains will run with virtually no interference from cars until Valley Rd and then again from SH20. There will inevitably be some interaction between trains and cars on Dominion Rd (it is naive to assume otherwise), but it should be manageable with appropriate signal pre-emption etc. Running the line through Onehunga Mall and Mt Albert Rd would inevitably add more time. In my view, it would tip the balance too far in favour of connecting central isthmus neighbourhoods at the expense of providing rapid transit to the outer suburbs. This is the same issue that arises with the NW LRT. Should trains run from Ian McKinnon Dr straight onto the NW motorway, or should they wend their way through Great North Rd. As this blog has argued, speed and cost suggest the former, even if the latter leads to much larger catchments along Great North Rd. Similarity with NW is true. I’m not sure what I conclude for either. +1, this post is logically inconsistent with GA’s northwestern proposal. Putting the southwestern RTN down Mt Albert road is fine, but putting the northwestern down Great North Road isn’t? I think this case is much worse as well, as these suburbs would be better served by another line which can be built in the future making the track on Mt Albert Road a time consuming detour. Great North Road would still be a useful LRT line even if in the future we built a motorway alignment. To me the other obvious isthmus line is Manukau Road, connecting to to the city via Symonds Street. Then you pick up the hospital and universities on the network as well. You could take Manukau Road to Onehunga via Mt Smart/Onehunga or Manukau/Trafalgar. Didn’t the Vision Zero recommend 30km/hr speeds on shared roads? so is the plan still to run LR vehicles on street sections at 50Km/hr between stops? Vision Zero does not apply to road running LR trains or trams? because they will not collide with peds or bikes? The LRT tracks aren’t shared, for one. And there is no reason that we couldn’t also include cycle lanes along most of the road when we put LRT in. All the images of LR running in streets shows track space shared by pedestrians crossing the street so I assumed that was the plan for Queen Street and perhaps Onehunga Mall. I read somewhere that LR cannot slow or stop as quickly as rubber tyred vehicles. Will there be high kerbs or low fencing to keep pedestrians away from the tracks? i just can’t figure out how this would work from a safety viewpoint. Mike yes, in Queen St, or Onehunga Mall, LR will run like in Bourke St in Melbourne, really slow. The trade off is that these are destinations and sources of huge numbers of users, exactly as in Melbourne. However what will be completely unlike how they run in Melbourne is that away from these shared spaces they will not be sharing their right of way with traffic, so able to travel up to the speed limit unobstructed by vehicle congestion. They will also have signal priority at intersections. So an overall running speed, including stops, will be much better than Melb…. I encourage you to go to the Gold Coast, Melbourne, or one of hundreds of cities in Europe (if possible) to understand how this will work. Széll Kálmán tér is a great example of a share public transit space – buses, underground, trams and cars. Unfortunately the street view is before the completion of the redevelopment last year, but you can see it on the overhead. We lived in Budapest for 10 months without a car. Ban Josip Jelačić in Zagreb – another main town square with buses and trams. The Street leading to this – Ilica – is an example of trams, cars and people. The old trams in Budapest and Zagreb are maybe slower than the modern LRT, but the modern TMK 2200 can get up to 100 km/hr. Off topic, but those swimming pools on Margaret Island really stand out. What a fabulous place. Best part is you can swim and eat langos. 🙂 Great fun. As other’s have said, it’s good to think outside the square & toss ideas around. I think I’d prefer the existing route idea. I suspect the time lost will be greater than 4 mins, though this is more than offset with better catchment but this is trying to kill to many birds with one stone. Mainly I’d leave the catchment of (at least) the Royal Oak/Onehunga area to a future Manukau Rd line. Surely we want LRT down Newmarket at some stage? My big question is: when talking about using the motorway, are we definitely looking at reallocating motorway lanes? Or are we looking at something elevated above the lanes that doesn’t reduce motorway capacity? Similarly, what would it involve on the roads? Road widening? Or just reallocation? From my point of view, I want to see roads and motorway lanes reallocated, no further removal of land for transport, and the resurrection of places and trees. Any reduction in vehicle capacity – as long as it is accompanied by increase in people-moving capacity – is a huge benefit, as it has traffic evaporation effects elsewhere. So what about keeping the original route using motorway lane reallocation, putting in one extra stop to between Onehunga and Hillsborough, which then allows the roads to be reallocated to buses and cyclelanes and trees and better footpaths? SH20 has some bus lanes. The LR would come down on the north side of SH20 to Princes St, cross over the existing HR station and Neilson St at elevation. Down over the New (Old) Mangere Bridge. West side of SH20 until around Walmsley Rd then into the centre. Probably be some lose at Princes St – not entirely sure how the plan looks regarding the Taumanu foot bridge. Also the area between SH20 and the Lagoon is very tight. This could be an argument for coming up at Queenstown Rd and going down Beachcroft. I image the LR will come up out of SH20 at Hillsborough Rd to create a station. Obviously no need to account for option F EWL in that anymore. The HR alignment is interesting as well. Yes (as you noticed alignment plans below), the alternative elevated section alongside/above the lagoon instead of hugging Beachcroft Ave looks nice and straighter/faster & leaves the park there more untouched. Princess St would lose general traffic width but looks pretty wide there. At the cost of blocking the view onto the harbour. But the Beachcroft route also removes the playground and cuts the lagoon off from the town. Bit of mixed bag either way. Mitre10 is a big destination on Princes St. RSA will probably complain about the loss of parking, but yeah Princes St is wide enough. The Good Home gastro-pub next to the RSA will notice the loss of parking too. We’ve had to go over to Waller St carpark a couple of times when going there on a mid-week evening. Might be worth a deal with Repco etc for evening parking. Not sure how much extra business they can expect from being 150m away from a LR station with big gaps to the next stations. Conversely they may get more people from out of Onehunga visiting since they are right next to the LR station. Particularly those who want a drink and thus can’t drive. It will differ for each business. Personally I think the direction from the airport to Onehunga could be interesting. Travellers to pop into dresssmart or go to the closest beach for a nice sea side walk. Then there is Transform Onehunga and the port. Ferries from here to the west/Huia or Awhitu open up some interesting opportunities for day trippers or transit travellers connecting via the HRT or LRT. If we do not construct a motorway Light Rail corridor between Mt Roskill and Onehunga, we are going to face capacity issues when Light Rail is constructed on Mt Eden or Manukau Roads. If both the Dominion Road line and Manukau Road line have LRV’s operating at 5 minute frequencies on Mt Albert/Mt Smart road, signal preemption will need to operate approximately every minute. I think that this will not allow enough time for the required traffic movements. It would be much better to operate the Dominion Road and Mt Eden Road via the motorway alignment with plenty of capacity. Three Kings can still be served by Mt Eden buses/Light Rail, and Royal Oak can be served by Manukau Road buses/Light Rail. Are we expecting light rail to be underutilised if it runs alongside SH20. I’d have been a sceptic about running light rail alongside the motorway, instead of along populated road corridors BUT for the fact that the Northern Busway does this extremely successfully, and does not appear to suffer from under-use. The key to a “rapid” transit network is “rapidity”, and the best way of achieving this is to keep LRVs off the roads and on their own rights-of-way. That’s why I also strongly favour running the promised North-West line up Queen Street and then from Ian McKinnon Drive onto the NW motorway alignment and from there all the way up the motorway to Westgate. Not along Great North Road, even though from a personal point of view that would suit very nicely indeed. Why the great urgency to save four minutes in a trip to the airport. Once you get there you are standing around for hours. If that four minutes is so important, simply leave home four minutes earlier – it’s called time management. If you are standing around the airport for hours these days, you are generally doing it wrong. Main reason to be there for more than a couple of hours (much of that not standing around) is a good run after leaving a buffer for traffic issues. Four minutes is important when comparing to alternative modes – even though most usage will not be airport passengers. More time means more rolling stock and operating costs as well (although offset by more revenue we hope). If you lived in Mangere and worked on this line north of Mt Albert Road, you’d probably be pretty dark about losing over a day and a quarter every year for this. Compared to what they have now? Hmmm… I see pluses and minuses between the options, but either is fantastic. I wonder what those numbers are vs those going south or east. Maybe be faster harbour end CBD workers to LRT over the crossing and then onto Onehunga HR (23min). In fact South to West transit might operate like that in the short term depending on the NW LRT timing – LRT to Onehunga and then interchange onto the HRT for west. I’m on the edge, although the option raised here does potentially serve a greater population size. The SH20 option to me seems like a logistically better route for rapid transport option, especially when at one stage (is it still on the cards?) to have future line down Mt Eden and Manaukau Roads which would service this area. Is it possible that the better catchment of this proposal means, simply, that more people will use it, freeing up capacity elsewhere? I don’t know whether that means people in cars would be less congested (least likely due to induced traffic) or enabling more dedicated bus lanes or more road space allocated to active modes… and that there are therefore travel time savings in the whole network that more than make up for 4 minutes extra time on the LR? I mean, can anyone actually work this out anyway, or do you just go with a gut feel about maximising catchment or maximising speed? Commuters will likely priorities constant travel times. Even if a car trip is faster, commuters might not switch back given a choice. However, a decision south of Onehunga will likely be impacted by increased travel times if going north. Probably depends on connections, etc. Part of this decision also has to be about future plans. If this LRT route is the only one though the central void, then Royal Oak is probably a good option. If more LRT routes will be added later, then a rapid route might be better if you consider it as part of the network. For example if Transform Onehunga and the intensification pushes Onehunga towards more of a metro place. Then a frequent link bus from Royal Oak into the LRT/HRT network might work just as well. Especially if adding the LRT means that people who plan to work in the airport or southern business growth zones then decided to live in the area. Well done for continuing to deliberately misinterpret my argument. No additional buses on Wellesley, simple.